Good people, you still have until Monday, August 29, 2011 noon MDT to enter the raffle for a fine art print of your choice. Thank you!! Lately it seems everyone is asking the same question, “Where did summer go?” In the case of my Seattle friends, they’re asking, “Summer who?” The start of the academic year tends to be a major social signal that summer is over. If I step outside my house in the afternoons, I can hear the children at the elementary school screaming and laughing at recess. If I drive through Boulder, it takes me twice as long to get anywhere because of all the new (and disoriented) freshman at the university. While I am already daydreaming about 4 foot powder dumps in winter (okay, I’ve been daydreaming about that since the last time I skied on June 21), I know that will come with a little time and perhaps some patience on my part. Autumn is surely coming, but we’ve still got some weeks of summer left as is evidenced by our near 100°F temps, daily thunderstorm cycle, the height of color at the farmer’s market, and meetings in the park with friends on blankets. I haven’t shot a recipe I’ve made in a couple of months and it feels like forever. It isn’t for lack of mojo as there are several scraps of paper (both carbon-based and silicon-based) strewn about reminding me of recipes I want to try making and blogging. The mojo is there, just not the time. So I’ve dug deep into the queue and found a recipe for the chicken salad puffs I served at the afternoon tea I hosted a while back. It really was a while back – it was in November of last year. I’m hanging my head in shame at my lameness. But I assure you these chicken salad puffs are far from lame! When the weather cools, I love to make my own chicken broth. I like the broth far more than the chicken and usually end up with a surplus of tender cooked chicken. That chicken meat is handy for throwing together soups, quesadillas, enchiladas, or salads. 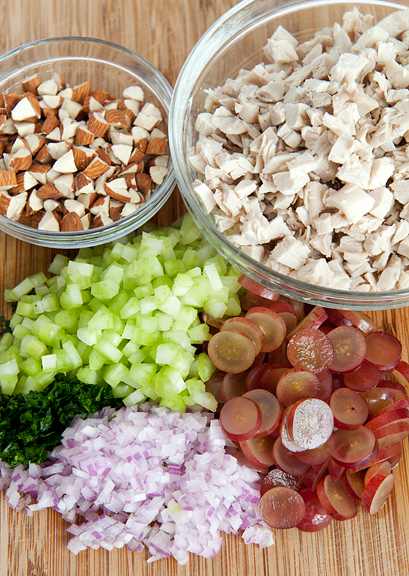 Chicken salad pitas or sandwiches make for quick and easy lunches. Chicken salad croissants are an occasional indulgence. 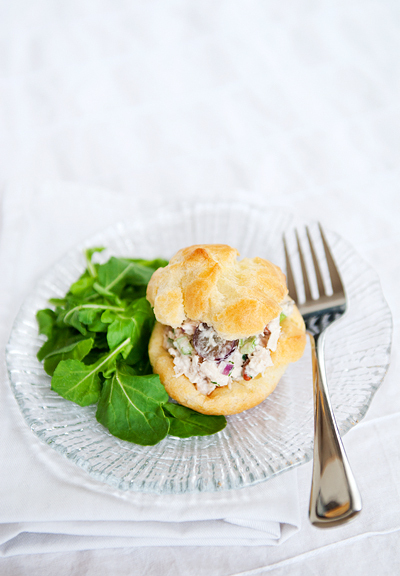 But the chicken salad puff is probably my favorite way to enjoy chicken salad. It’s just so cute and little. Half the fun of throwing an afternoon tea is scouring the interwebs for menu ideas. And I would be lying liar if I didn’t credit Lisa with some of the best ideas because she’s amazing and stylish like that… and a hoot and a half! So I had made chicken salad countless times in the past. Same for cream puffs. But this time I just omitted the pastry cream in favor of chicken salad. I reserve a very special place in my heart (and stomach) for savory pastries. Usually when I hear the word “pastry” I think “time investment”, but these puffs are practically the simplest and most straightforward pastry you could make. It’s the kind of thing I can do when I’m feeling spent and brain-fogged and still have them come out essentially perfect. The dough bakes into a wonderfully light and hollow shell. Slice the puff open and spoon some chicken salad into it. Equally good for entertaining as it is for a quick bite. Preheat oven to 400°F. Bring the water and butter to a boil in a medium saucepan. Remove the pan from heat and add the flour all at once. Mix the flour in to form a ball a dough, then stir in each egg one at a time until completely incorporated. The resulting dough should be smooth and satiny. Pipe the dough or drop by rounded spoonfuls in 1-inch rounds onto a parchment-lined baking sheet and bake for about 20 minutes or until the puffs are… puffy and golden. Remove from baking sheet and let cool on cooling rack. 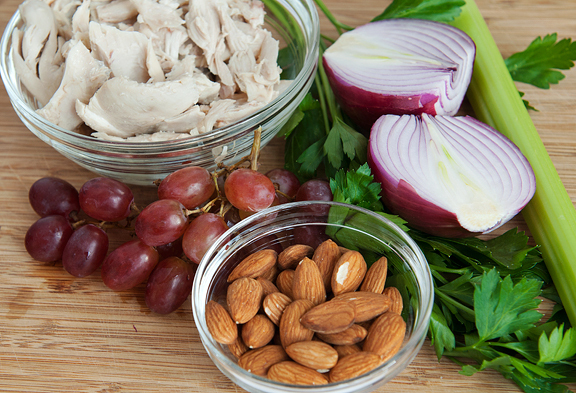 While the puffs are cooling, combine the chicken, grapes, celery, onion, almonds, parsley and mayonnaise in a mixing bowl. Season with salt and pepper to taste. When the puffs are cooled, slice the tops horizontally (you can leave them attached or not – totally a matter of preference). Scoop some salad into each puff and cap with the puff top. 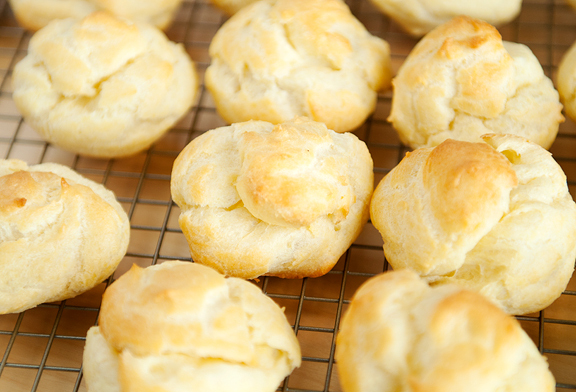 Makes 2-3 dozen (depending on how you size the puffs). Beautiful puffs, and delicious chicken salad! Holy goodness, I just wet my pants, this looks so good! Please kiss Kaweah’s ears for me. They look so silky and soft and wonderful. 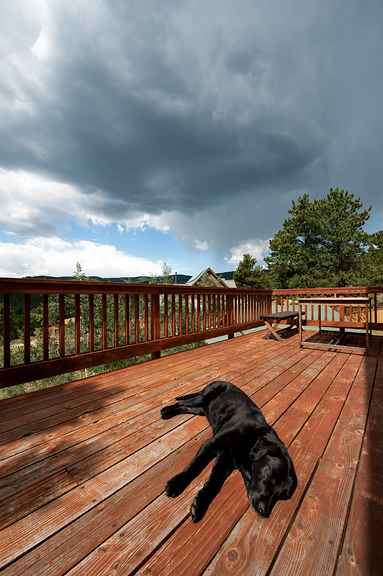 She looks just like the family dog I grew up with, a black lab who lived with us from my third year to my nineteenth. She was the best and five years later, I still miss Kelli to pieces. Aw man I just finished eating a healthy oatmeal and peanut butter breakfast and now I’m already craving this. Looks delis, Jen! The salad sandwiches are not only cute but also sooo tempting. These look amazing! And I adore the photo of Kaweah — she looks so content! Awww…Kaweah…blissfull. I never realized puffs were so easy to make! I will be making these little sammies to take to my book group next week. Most of my book group members are more about the food than the book, so they will be thrilled! Beautiful is mountain biking or hiking with my dog Sophie flying by my side. Skiing in powder on a sunny day. Snuggling with my grandaughter while we read books again and again. I am blessed with good health and my basic needs are easily met. Today I am attending the funeral of a dear friend, father of 2 young girls, who 6 months ago was a robust, super-positive, funny phys. ed. teacher. I will return home to help my neighbor move his wife from chair to bed. Life can turn in a blink. I try to remember to live it in the present, appreciating small moments and big. god i feel dumb for asking this but, what flour do i use? I love your blog! Our house smells so much nicer when Jen tries one of your recipes. Thanks! Something different to do with pastry puffs. Thanks. 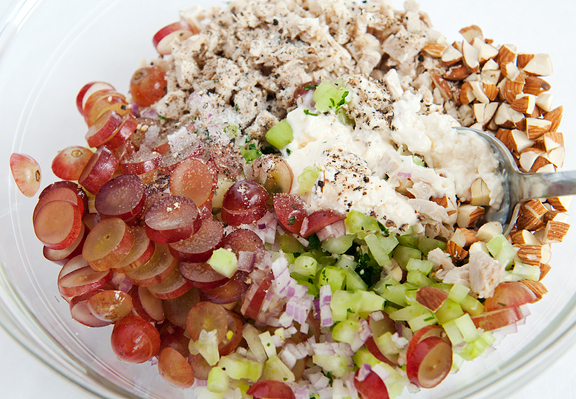 Love, love, LOVE grapes in chicken salad. They just make me so happy! 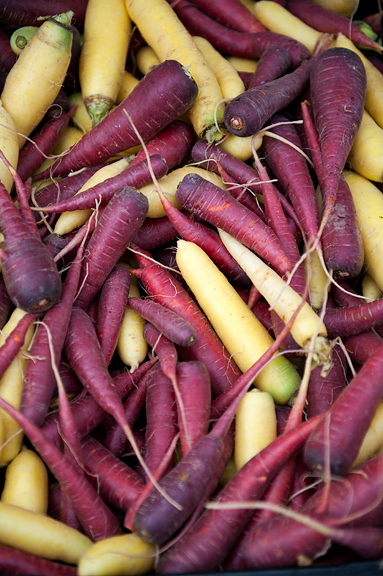 What gorgeous veggie shots. 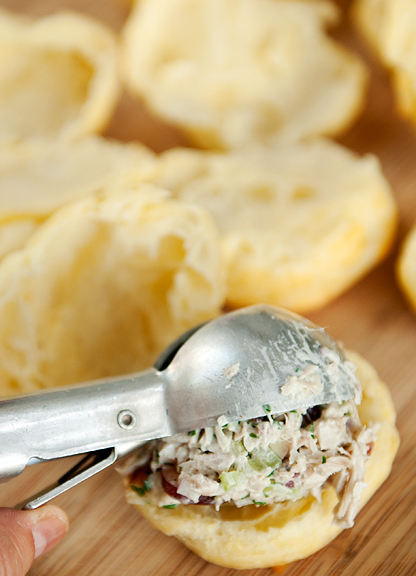 These little choux pastries are the perfect way to serve chicken salad – easy (maybe too easy) to pop right into your mouth. I remember these! As I remember the tea party! You totally outdid yourself that day! Mmmmm! I need a Felix-fix. When you think he can’t get any cuter, he goes right ahead and proves you wrong. sael – don’t feel dumb! There are so many flours out there, it’s hard to know which one :) I used all-purpose flour (unbleached, organic). Oh these look so adorable and fancy and yummy all in one petite bite. Those puffs look sooo good! I can’t believe the recipe is so simple. Looks delicious! I shall make this tonight! 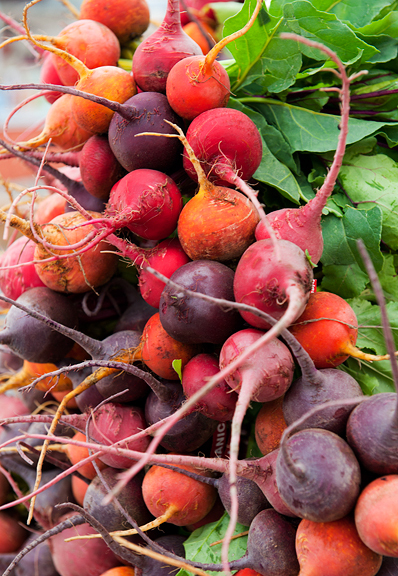 Beautiful pictures, a good way to advertise vegetables! Gorgeous Kaweah (as always). Linda – I hope they’re a hit! Rumpy – awww, you’re so kind. Manisha – I know! He’s the cutest little gummy bear ever. jenjenk – ha ha ha! I love that. Hello Jen, just want to seriously say “THANKS!! !”…am stuck at home trying to get it together after a 2 year long continous battle with the old, you know, chemo-and-all-that-fun-stuff thing….and your site is really inspiring me…i love to cook, bake, eat, and then do it all over again!…i even turned it all into a cafe and catering business, but unfortunately can´t work at the moment…since finding your site i am getting on the road again!!! I am re-discovering what i love, and that is food(since i can finally somewhat eat again!)! Just baked your puffs, will fill them with lemon curd and whip cream, love it!! Question: the beautiful puffs fell after i took them out of the oven, but they look done…is this normal? P.s. i live in berlin, germany…maybe the white flour is different? Respect, your site it great! Lisa – :) Glad to see your post! I love this idea! I just made a batch of chicken salad. I like to use grilled chicken that has been marinaded. I add a bit of worcester sauce, fresh lemon juice, celery, and dried cranberries or cherries. This time I used both. :) I also add a bit of salt and garlic powder – just a touch. It makes for a complex and lovely blend of flavors… mmmm… I, however, have never thought to put it in a puff! I will def be trying that! Beautiful pics, thanks for posting! Don’t you need to let the dough cool some before adding the eggs? And can you add a little sugar to sweeten them up? Thanks! Kay – no, you don’t need to let the dough cool. just make sure you add them and stir them in quickly! :) Traditionally, sugar isn’t added to the dough. 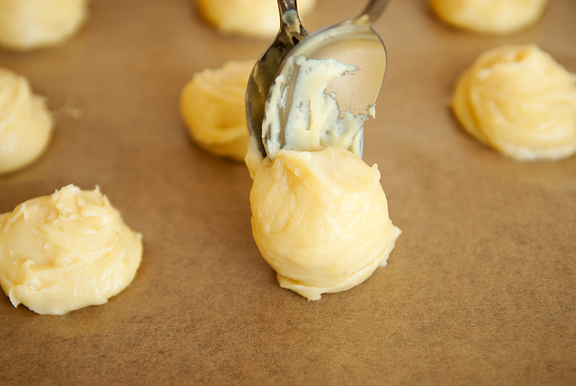 If you want to use them for cream puffs, the filling will be sweet enough. It’s supposed to be more eggy than anything else. Hi! 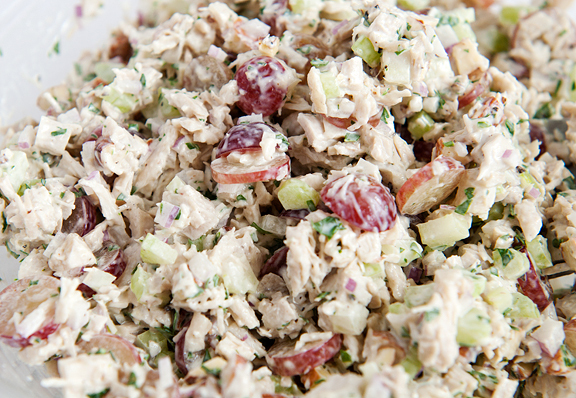 I made this whole recipe, the puffs and chicken salad, and I LOVE it all!! Totally delicious. The puffs were great with the chicken salad, with some tuna salad I had left over, and even filled with nutella and dusted with sea salt (don’t tell my husband)! The only problem I had is that I had eaten about half the puffs when I reached into the tupperware container for another, only to realize every single one in there was moldy! Now I know these things aren’t going to last as long as regular bread because I’m not adding any preservatives or anything, but is there something you do to help them last? 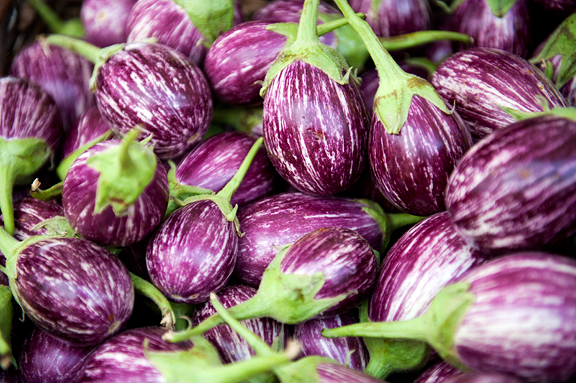 (Other than just eat them all within a day or two, of couse!) Maybe refrigerate them? Anna – yes, I think if you live someplace relatively humid, you’ll have to refrigerate them. I can keep them in tupperware out on the counter (if it’s not summer) for a couple of days, but that’s about it. They’re quite moist as it is. Glad you liked them! I have made these a couple of times and they are always a big hit. I was wondering how well do the puffs freeze? I need to make a big batch of them for a function I am doing and I thought to save time I could make the puffs 2 weeks ahead and then just defrost and fill. Do you think they will be just as good? Lisa – hard for me to tell without knowing what you did. Can you give me more information? Can I fill the puffs with the chicken salad the night before? Or will they get too soggy? Kathy – oh, I think they’ll get soggy :( If you can fill them just before serving, that might be best. Sorry! The puffs are so cute and delicate but has such a strong egg taste. Can I bake the puffs the day before and fill with CS right before serving? Melinda – yes, you can – but the puffs will be soft rather than crisp on the outside.